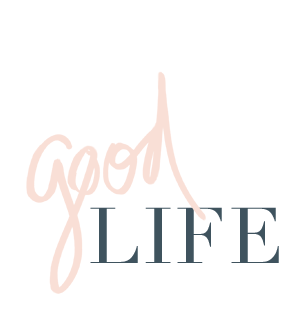 jillgg's good life (for less) | a west michigan style blog: my winter skincare routine! I've gotten a few comments or questions about my skincare routine lately so I thought I would do a quick run down of the steps I'm taking each day. In addition I have switched it up a bit with some new products and with winter in mind - I always use more product in the winter to keep the dryness away. 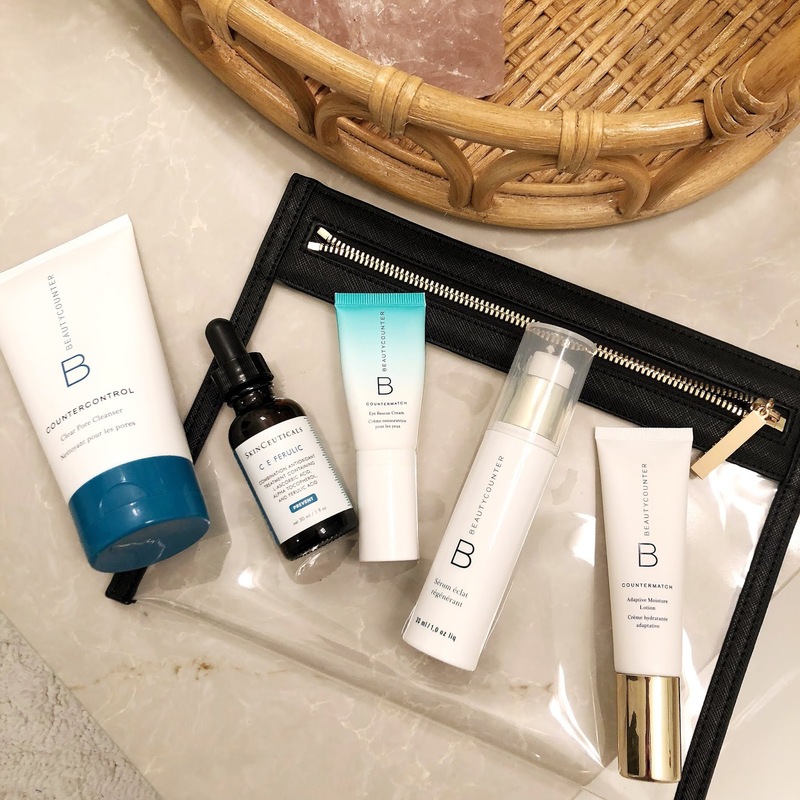 All of these products here have been carefully selected - you may know already that I am STRONGLY committed to safe beauty but it also has to be EFFECTIVE. I am prone to breakouts and at 40 years old I am also working to combat the signs of aging. So skincare has to REALLY prove itself before it officially gets into the rotation. On top of that I always want to use a product for AT LEAST a few weeks, if not more, before I tell the world "YES, I like this." While I can usually tell right away if I like a product or not, I will admit there have been a few I have tried and liked and then been let down. So these are ONES. Step 1. I always wash with this acne fighting Countercontrol Wash. It smells amazing and is gently exfoliating. It leaves my skin fresh and clean and I always like to know that I have a little acne fighting on my side to start the day. If you've dealt with adult acne, you know how nerve-wracking it can be (when will I break out again!?!) so I always like to be on the offense. Step 2. I've been using the CE Ferulic by Skinceuticals for years now and while it's pricey - you only need a very tiny bit and I find a bottle lasts a very long time. Vitamin C works both to repair past damage to your skin and prevent new damage. I can't recommend this enough. Step 3. I've been playing around with adding either Tidal by Sunday Riley or B-Hydra by Drunk Elephant as a step three. Both I have mini samples of and I'm still deciding which I like best. I will report back - so far I'm enjoying both, but nothing has made the final cut yet. Step 4. I recently switched to this eye cream simply because I ran out of what I was using regularly and I had this Countermatch Eye Rescue Cream on hand. I was just going to use it for a bit and reader my usual, but I really fell in love with this. Again, you only need half or a quarter of a pump, it's very concentrated and it's incredibly hydrating and people rave about it helping with dark circles (I don't often suffer from dark circles, but I know those that do are super frustrated by it). Step 5. I've been using this Rejuvenating Serum again, for years! It makes my face feel incredibly smooth and is great for fighting wrinkles and dryness (which can cause wrinkles to worsen). Step 6. I skip a day cream in the summer, but when fall and winter roll around I always reincorporate it. Last winter I used a product that felt too heavy this year. So I tried this instead on a whim and LOVED it. The Countermatch Daily Adaptive Moisturizer adapts to your skins needs making it the perfect daily moisturizer. 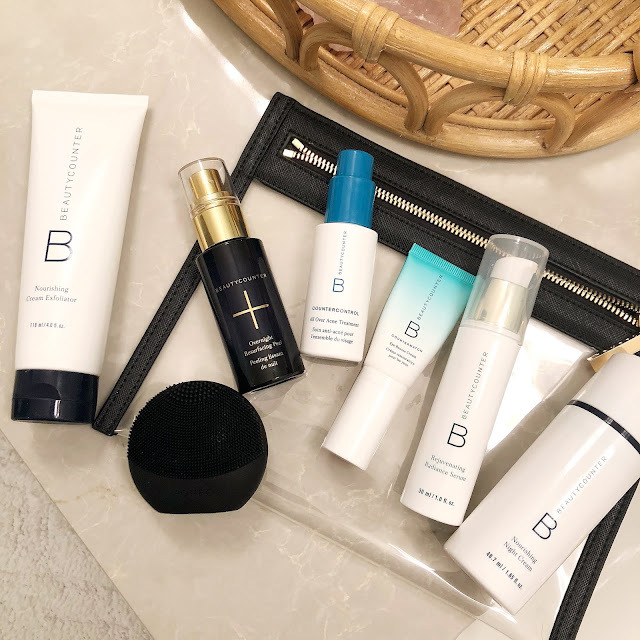 It's newer to the Beautycounter line and I simply just hadn't tried it yet! I'm so glad I did because it's lightweight but leaves my skin soft and supple - and ready for makeup! Step 3. Again, to combat acne I am sure to use this All Over Treatment every night as well. This product smells amazing and you just need one pump to cover your entire face. So far I am really loving this new acne line, my son uses it as well and if you wanted to try it out for the first time it's available in a travel size set for a limited time. Step 4 & Step 5. I use the eye cream and serum from the morning routine again. Step 6. The final step is the Nourishing Night Cream. This is another product I have been using for a while and I really like it. It's simple and it works. What more can you ask for? My skin still feels soft in the morning when I wake up, which I always take for a good sign.